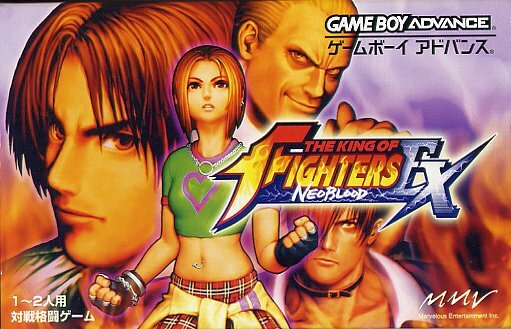 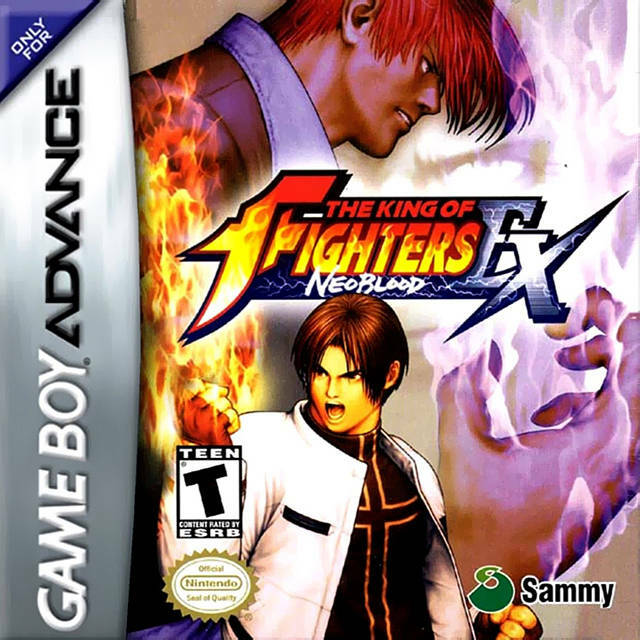 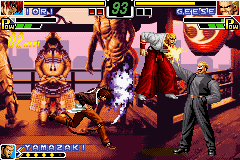 REVIEW: The King of Fighters EX: Neoblood brings SNK's trademark series to Nintendo's Gameboy Advance. 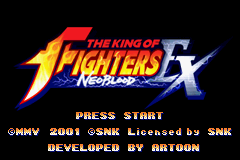 Neo Blood introduces a new story scenario that takes place between the Orochi Chapter and Nests Chapter of the series. 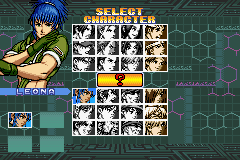 18 characters, 2 bosses, and 10 strikers make up the total roster... pretty impressive for a handheld fighter in 2002. 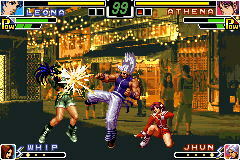 A newcomer, Moe Habana, also makes her first appearance in the franchise. 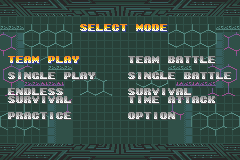 NeoBlood features a decent mode selection as well, including: Team, Single, Survival, and Practice. 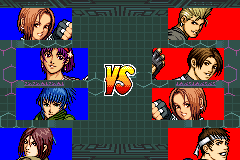 You can also challenge a friend in VS mode via GBA link cable. 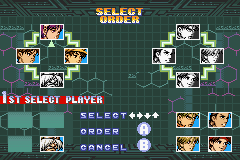 A similar character selection to KOF '99. 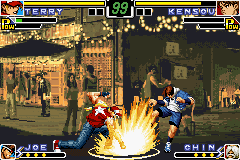 While it's nice to see a traditional KOF game make an appearance on the Gamboy Advance and translate fairly well visually, the controls are on the stiff side of things. 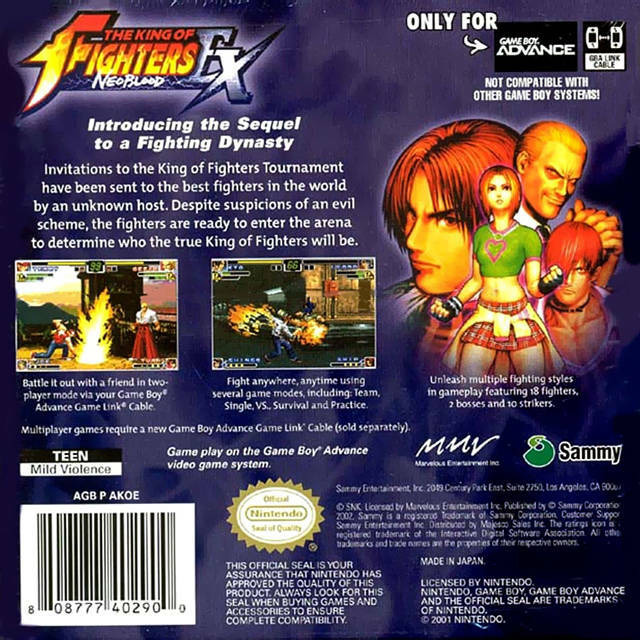 It's playable, but more than likely you'll be whiffing moves that you tend to pull off a lot easier using a regular controller or arcade stick. 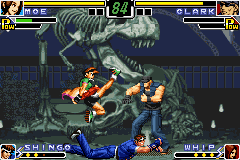 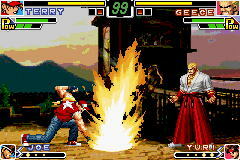 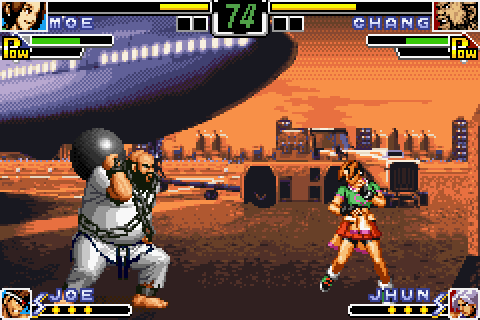 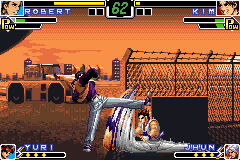 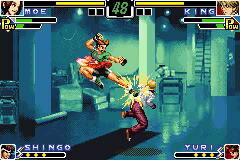 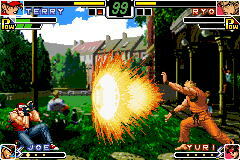 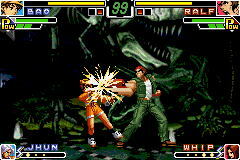 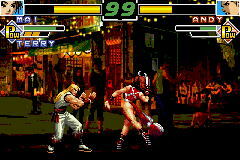 NeoBlood features a striker system based on KOF '99, making the gameplay a bit more dynamic than the standard 2D fighter. 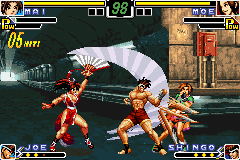 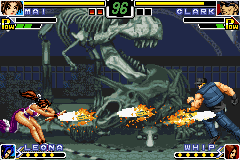 However, the overall gameplay just isn't quite as sharp as it is on the NeoGeo (or other consoles). 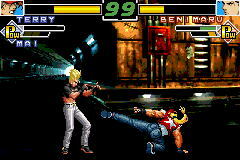 There are also a few weird glitches and infinites. 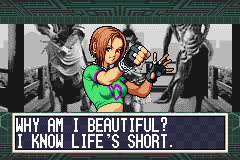 Visually, as one might expect, NeoBlood doesn't offer anything groundbreaking on the GBA, but the 2D sprites translated fairly well to Nintendo's small screen. 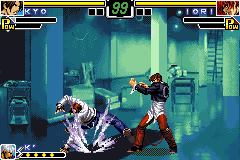 While the sprites look decent, unfortunately, they missing quite a few animations. 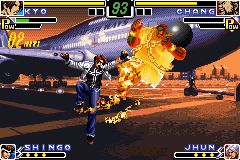 The drop in animation quality is easy for any returning KOF player to see, and is one of this version's most noticeable flaws.